Johann Joseph Christian (12 February 1706 – 22 June 1777) was a German Baroque sculptor and woodcarver. His masterworks are considered to be the choir stalls in Zwiefalten Abbey and Ottobeuren Abbey. Christian was born in Riedlingen, in Further Austria (present-day Baden-Württemberg). His rare double gift as a woodworker and stucco sculptor was equalled only by Joseph Anton Feuchtmayer. In 1744 Christian received a commission to work in Zwiefalten Abbey, where until 1755 he created the choir stalls and numerous stucco figures for the high altar and nave and side chapels, working alongside the painter Franz Joseph Spiegler and the stucco master Johann Michael Feuchtmayer and under the direction of the architect Johann Michael Fischer. Riedlingen is a town in the district (Kreis) of Biberach, Baden-Württemberg, in the south-west of Germany. It is one of the destinations of the Upper Swabian Baroque Route. Riedlingen has approximately 10,000 inhabitants. Further Austria, Outer Austria or Anterior Austria was the collective name for the early possessions of the House of Habsburg in the former Swabian stem duchy of south-western Germany, including territories in the Alsace region west of the Rhine and in Vorarlberg. Subsequently, Christian was commissioned to work on the abbatial church of the Holy Trinity in Ottobeuren Abbey, for which the architect was once again Fischer and for which Christian created the choir stalls, with gilded reliefs, and the organ reliefs. Once again he worked with Spiegler and J. M. Feuchtmayer. Besides these two major works, he also worked on various smaller projects, including the parish church in Unlingen and the abbey church in Buchau. Unlingen is a town in the district of Biberach in Baden-Württemberg in Germany. The Imperial Abbey of Buchau was initially a monastery of canonesses regular, and later a collegiate foundation, in Buchau in Baden-Württemberg, Germany. The abbey was a self-ruling Imperial Estate and its abbess had seat and vote at the Imperial Diet. Bad Buchau is a small town in the district of Biberach, Baden-Württemberg, Germany with about 4,000 inhabitants. It is situated near Lake Federsee, which is separated from the town by a wide reed belt. Christian and his wife had 10 children, of whom five survived infancy. His son Karl Anton Christian (1731–1810) became abbot of St. Trudpert's Abbey near Münstertal in the Black Forest, and for this church J. J. Christian created a relief painting using a stucco technique for the high altar that is considered unparalleled. Christian died in Riedlingen. Another son, Franz Joseph Christian (1739–1798), became a sculptor and took over his father's workshop in Riedlingen. St. Trudpert's Abbey is a former Benedictine monastery in Münstertal in the southern Black Forest, Baden-Württemberg, Germany, now the principal house of the Sisters of St. Joseph of St. Trudpert. The Münstertal is a municipality in the southern Black Forest, which belongs to the district of Breisgau-Hochschwarzwald in Baden-Württemberg in southern Germany. It is 3 miles east from Staufen. Wiblingen Abbey was a former Benedictine abbey which was later used as barracks. Today its buildings house several departments of the medical faculty of the University of Ulm. The former abbey is located south of the confluence of the rivers Danube and Iller, south of the city of Ulm in the German state of Baden-Württemberg. Administratively, the former independent village of Wiblingen now belongs to the city of Ulm. The abbey is part of the Upper Swabian Baroque Route. Zwiefalten is a municipality in the district of Reutlingen, located halfway between Stuttgart and Lake Constance. The former Zwiefalten Abbey dominates the town. The former monastery is considered one of the finest examples of late Baroque art. Zwiefalten Abbey was a Benedictine monastery situated at Zwiefalten near Reutlingen in Baden-Württemberg in Germany. Wilhering Abbey is a Cistercian monastery in Wilhering in Upper Austria, about 8 km from Linz. The buildings, re-constructed in the 18th century, are known for their spectacular Rococo decoration. Johann Michael Fischer was a German architect in the late Baroque period. Matthias Steinl was an Austrian painter, architect and designer, and one of the country's best known Baroque sculptors. Together with Johann Bernhard Fischer von Erlach (1656–1723) and his rival Johann Lukas von Hildebrandt (1668–1765), Steinl may be considered one of the most influential architects to introduce the High Baroque style to Austria. The Upper Swabian Baroque Route is a tourist theme route through Upper Swabia, following the themes of "nature, culture, baroque". The route has a length of about 500 km. It was established in 1966, being one of the first theme routes in Germany. There is an extension to the route into Switzerland and Austria around Lake Constance. Johann Michael Feuchtmayer was a German stuccoworker and sculptor of the late Baroque period. He collaborated with the architects Johann Michael Fischer, Johann Joseph Christian, and Franz Joseph Spiegler on numerous ecclesiastical buildings in Upper Swabia. His stucco decoration in the Benedictine abbey church of Ottobeuren is considered his crowning achievement. Matthäus Günther was an important German painter and artist of the Baroque and Rococo era. Franz Joseph Spiegler was a German Baroque painter. He is best known for his frescoes, which decorate many of the churches and monasteries along the Upper Swabian Baroque Route. The frescoes in the Zwiefalten Abbey are considered his masterpiece. The Feuchtmayers were a German family of artists from the Baroque Wessobrunner School. Franz Xaver Feuchtmayer (1698–1763) was a German Baroque stucco plasterer of the Wessobrunner School. Johann Michael Feuchtmayer was a German painter and copper engraver. Franz Joseph Feuchtmayer was a member of the German Feuchtmayer family of Baroque artists of the Wessobrunner School. Franz Xaver Feuchtmayer was a member of the German Feuchtmayer family of Baroque artists associated with the Wessobrunner School. Joseph Anton Feuchtmayer was an important Rococo stuccoist and sculptor, active in southern Germany and Switzerland. Johann Baptist Straub was a German Rococo sculptor. Johann Baptist Babel was the preeminent sculptor of Baroque era Switzerland. Active mainly in Central Switzerland, he enjoyed an uncommonly long productive period that spanned the transitions from Late Baroque to Rococo and then to Neoclassicism. 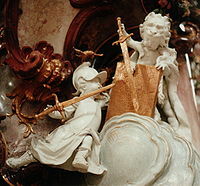 Anton Sturm was a Tyrolean sculptor who worked in the Baroque and Rococo styles. His works are primarily located in the Allgäu region and the adjacent parts of Upper Bavaria. ↑ Germany: A Phaidon Cultural Guide. Oxford: Phaidon, 1985. p. 648. ISBN 0-7148-2354-6. Wikimedia Commons has media related to Johann Joseph Christian .